Learn how to build above ground garden beds or raised planting beds which are perfect for planting vegetables. Raised beds can be ideal if you want to optimise your garden space and its productivity. Find out whats involved in building one and how you can make your own above grounds beds. 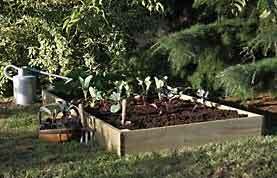 Building a raised bed to grow vegetables in is easy to do and has many advantages. Raised beds tend to drain better, meaning the ground is not too soggy for your crops; the soil warms up quicker in spring, meaning you can plant earlier. Raised beds also look a lot tidier, they’re easier to weed and you can easily set up netting over them to protect your crops. There is a huge advantage to having raised beds if you live in a poor soil area – you can make sure the soil in the bed is exactly as you want it. You can make your raised bed from a number of materials, but we’re going to look at how to make a simple wooden one. First you’ll need some wood. There are some concerns over using treated wood in the garden – some people believe that the chemicals used to treat the wood and preserve it can be bad for the soil. This certainly used to be the case, but most treatments are a lot kinder these days, and if you don’t use treated wood then unless you use expensive hardwood it will rot quickly. You’ll need some pieces of 2”x2” or similar wood for the posts – these need to be long enough to be driven into the ground securely and support the sides of your raised bed. You need one for each corner, and if you are making your bed quite long, you’ll probably want a couple of extra supports in the middle of the longer sides. For the sides of the raised bed, you’ll need some planks of wood. This can be whatever you can easily get hold of. Spare bits of decking, gravel boards from the base of a fence, or purpose-bought timber. Depending on the width of your wood and the height you want the bed to be, you will need one or two pieces for each side. You’ll need screws or nails of course for fixing the timber, along with a hammer or drill and screwdriver. When it comes to laying out the bed, you’ll need a tape measure, some string and four canes or stakes. A square is also handy to make sure you get your corners square. A garden fork, spade and wheelbarrow will be required, and a club hammer or mallet for driving in the corner supports when you come to build the raised bed. Choose the area you want to devote to your raised bed. You can make your bed any size you like, but it will be easier to garden if it’s narrow enough that you don’t have to walk all over it in order to weed and harvest your crops. Most vegetables will grow better if they have plenty of sun, so try to pick a spot that isn’t too shady. Using the tape measure and square, measure out your area and mark it out with canes or stakes and string. If you are building the raised bed on an area that is currently grassed over, you will need to take up the turf before you go any further. It is a good idea to dig over the area with a garden fork, to loosen the soil so that your crops have a better chance at putting roots down, and vegetables such as carrots and parsnips will be less likely to split. Make sure there are no weeds left, and once you’ve dug it over, pile the soil into the centre so that the sides are clear a few inches below the ground level. Drive the corner posts into the ground, making sure they go about a foot into the ground for stability. Depending on the size of the corner posts you are using (if you have opted to use larger, heavier posts) you may even need to concrete these in place. For information on how to do this see our Concreting Fence Posts project and also our Concreting Fence Posts Using Postcrete project. Do the same with any additional posts you are putting in the sides. Pick a side to start from, measure the exact width and cut your planks of wood to size. Nail or screw them to the posts, making sure the bottom piece sits at least half an inch below ground level. Once you’ve completed one side, move around and repeat the process for each side. If your pieces of wood aren’t long enough, don’t worry – just put in an additional support post where the plank ends, allowing it to overlap enough so that you can fix both the original plank to it, as well as an extra piece to make up the length of the bed. Supplement the soil in the bed with multipurpose compost, adding some well rotted manure if you like. Mix it in well and level off with a rake. Your new raised bed is now ready for planting!